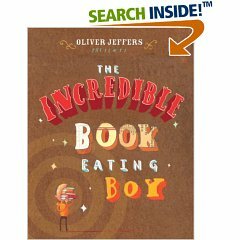 James says that this book should have been called The Incredible Book Eating Girl and that I should have been the feature character. And I am quite certain my mom is giggling as she reads this, too, because where else do you think I learned my book-eating skillz from? I devour books. I can get through a normal size novel in about a two hour stretch reading straight through. I have learned from experience not to read a series of novels until the last novel is out, because the suspense will drive me insane. I am only now reading through the Beverly Lewis Amish series, for example. It’s a delighful, delightful book. The artwork is collage-esque (my personal favorite) and Mr. Jeffers use of type is skillful and fun at the same time. Between fits of giggles while reading to the kids, I actually was inspired art-wise, and what more could you ask from a book? We regularly pick up somewhere close to 30 books in a library run- some that I’ve picked out based on reccomendations, others that have caught the kid’s eyes, still others that Daddy finds (he’s quite the scout…) Book eating is a skill everyone can benefit from, and I’ve found that the best way to do that is to make sure there is plenty of "food". I don’t try to push it on the kids other than talking about reading times in an excited tone: "Are we ready to go on another adventure?" They’ve caught the bug pretty well- you can often find at least one of my children "reading" at any given moment in an afternoon.